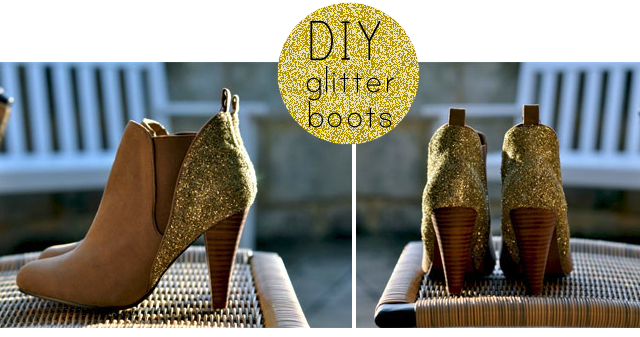 I'm loving these DIY Sparkly Boots from Le Fanciulle. And they look so easy to make! Simply find a pair of ankle boots, get yourself some glitter and some craft glue, and follow the step by step photo tutorial here. Hooray for glitter! awesome! I don't have any ankle boots right now, but if I ever get some, I'd love to try this. I LOVE THESE. i am totally inspired. These are wonderful. I've been thinking about updating my wardrobe with some DIY solutions. Happy that I came across your blog and found this. I've seen some other tutorials for DIY glitter boots, but this one is my favourite, since it's not 100%/overwhelming glitter. Love, love, love!